We landed in Tallinn in Estonia after a three hour crossing of the Gulf of Finland. We went to the city campground and set up camp. The campground was not much. It was an indoor sports building and had some grassy patches between some buildings that were very unkempt and a large paved area with electrical hookups for campers around the edge. But it is close to the old town which is what we came to see. 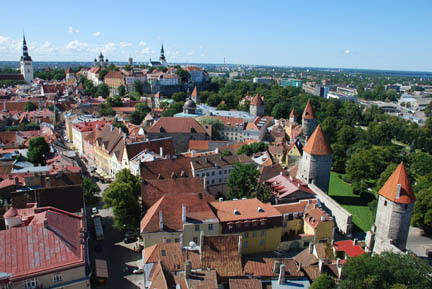 The "Old Town" in Tallinn is famous for its atmosphere and historical buildings. We climbed the very narrow and winding staircase to top of the cathedral's tower and looked out over the city. The walls and towers were visible and the other church steeples on the hill in the background with the city administration buildings. 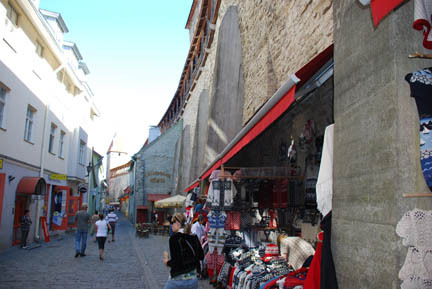 The area of the old town is now a huge tourist draw. 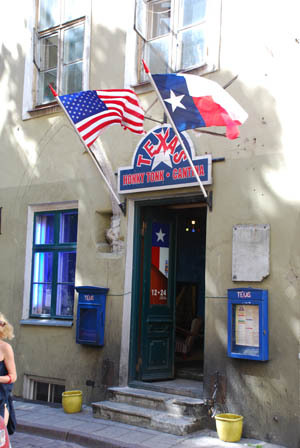 The business in the old town consists of souvenir shops, bars, cafes and restaurants. 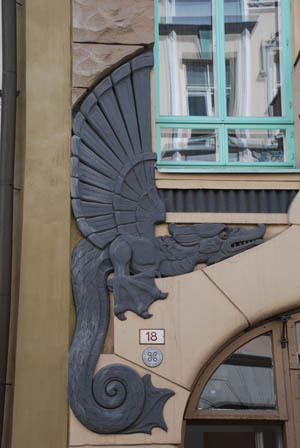 There were some interesting "art deco" buildings too. And an interesting selection of bars to drink in. 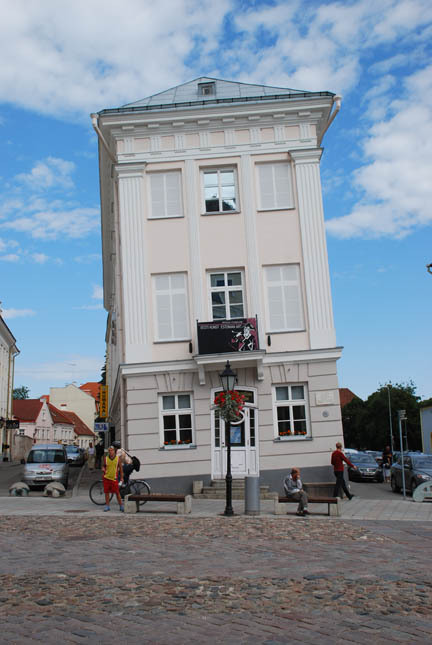 Then we headed to Tartu, a college town about 2 hours away to see another interesting building that was built facing onto the city square. Yes, the building tilts, but the doorway is vertical. Our guidebook states that the water table changed and that is why the building tilted. But we can't figure out why the doorway is vertical. Did they redo the door after the building tilted?? 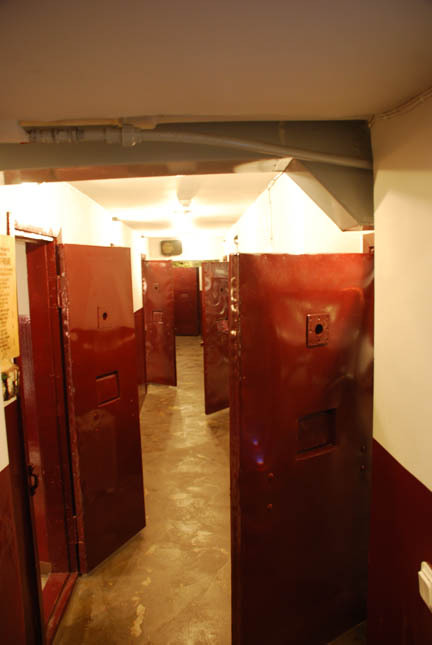 We also visited the KGB jail in the basement of a nearby building. This is where the Soviet secret police held people for transport to the Gulag prison camps in Siberia. It was still in use in the 1980's. The small cells are now a museum with pictures and artifacts from the period. Estonia was under Soviet control from early WW II to 1991 when the Soviet Union broke up. Estonian freedom fighters were active all during this period and were held here, if captured, before deportation to the work camps. After lunch we went on to the very southeast corner of the country and visited the Piusa Sand Caves. 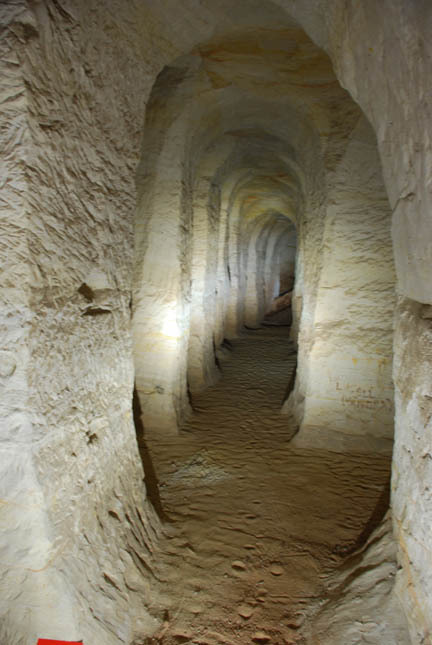 Not really caves but excavations of sand to be used in glassmaking. The miners left the columns to keep the hill above from collapsing on them. They mined here until the 1970's and now the site is preserved as refuge because endangered bats use the site for winter hibernation. We were only allowed into the first 30 feet of the site where there are railings and lights that illuminate the interior. Then it was off to find a campsite. We got a booklet and a recommendation from the tourist office. It turns out that the campsite is down several kilometers of gravel road. The roads are in good shape and present no riding hazard, but the trailer tires have had many thousands of kilometers on them and are in a very worn condition. We blew the left tire on a sharp rock and had to change it. This involves completely unloading the trailer and tilting it onto its tail. 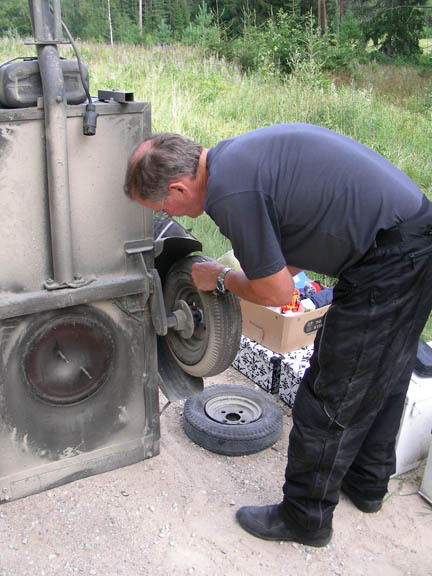 The spare tire is underneath and this is the easiest way to take off and replace the flat tire. Then it turns out the recommended campsite was completely reserved by a group, so we went back to the paved road and onto the one that they recommended. It was down another gravel road. We spent the night there and then headed for Latvia the next morning.